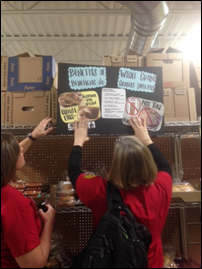 Student nurses post visual aids at the food pantry in Aurora. Lily Chen’s Population-Focused Nursing class took the classroom on the road and brought health education to a food pantry in Aurora. The class project required students to prepare visual aids to help educate pantry patrons on making healthy food choices. One of the products was several salt intake cards that could attach to the shopping cart for quick reference. Director of the Marie Wilkinson Food Pantry, Diane Renner, was so impressed that she plans to share the products with other food pantries in the area.